Of all Suffolk, this is the outback. Here, we are beyond the back of beyond. North of the Saxmundham to Leiston road, the tiny lanes thread between the flat fields. I was coming back here ten years after my first visit to this, probably the least known of East Anglia's ruined churches. It was a day in high summer, the temperature well into the 80s, but it was a pleasure to spin along the winding roads, with hardly any traffic to spoil it. I had cycled down from Halesworth via Dunwich and Aldeburgh, and all the way the trees had been in fierce full leaf, the day sodden and drowsy with heat. The breeze from the sea barely reached a hundred metres in land, but the churches offered the cool relief of their interiors, although there would be no such pleasure here, of course. How very different to my previous visit! On that late November day in 2000, the sun had neglected to rise, and the rains of the previous week were smoothing the topsoil across the roads as if attempting to erase them. My bike threw the mud up, spattering my clothes, face and hair, and it seemed that I was unlikely to be welcomed at the Friston Chequers in this state. Through the murk, an old bloke with a dog had appeared over the rise. He was the colour of the mud. While the dog went mental, I checked my watch to see if, in my urban manner, I should wish him a cursory 'morning' or 'afternoon'. But as I got closer, he lifted his hat and said "How d'ye do there?" and I realised how far I had come. I was obviously the first person he had seen for days, and he seemed agreeably pleased. And, perhaps, a little relieved, as if he had been entertaining a secret fear that some disaster had wiped out the rest of humanity, and he was the only one left. His dog was certainly unfamiliar with strangers, and leapt madly around me, rejoicing. I headed on, and it began to rain again, as if the sky had come down to join me. All the colours became one. I wiped the water from my face, looking for a footpath marked on the map that headed off eastwards of here. It would lead me, I hoped, to the remains of St Peter, Buxlow. Quite a lot is known about St Peter. It survived the Reformation, and Rectors were still being presented to the living as late as the 1620s. However, it doesn't seem to have survived the supression of the Church of England during the Commonwealth, for after the Restoration in 1660 no further Rectors are found. Perhaps the village was already too tiny to need it; whatever, in 1722 the Parish was consolidated with that of Knodishall, and St Peter was demolished for building materials. I was pleased to discover that the footpath was, in fact, a cycleable track. It led after about a quarter of a mile to a 19th century brick house, which was promisingly called 'Church Cottage'. The footpath continued into the field beyond. Somewhat surreally, the giant golf ball of Sizewell B Nuclear Reactor simmered on the horizon. No church to be seen here; but when I turned back to face the cottage, there was an ancient flint-stratified remnant in the back garden of it. I had found St Peter. The ruin consists of a curved flint wall with a tall gap running the height of it, like a decayed tooth, about 4 metres high and 3 metres wide. I am afraid that I then made an error, and described it in the first version of this article as the eastern face of the round tower, the part that would have been inside the church. Coming back, I could see that this was not the case. In my defence, the first time I had seen this ruin it was so overgrown that I could not see that the gap was not a former archway. The owners have cleared the site up in the intervening years, and you can clearly see that this opening was, in fact, a window. 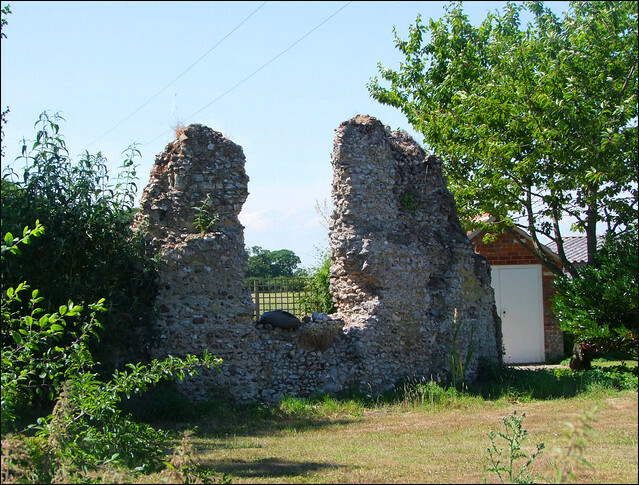 The wall is therefore something more interesting than a round tower, it is the curved apse of a Norman chancel, more common in Norfolk than in Suffolk, which only has a couple of survivors. The opening seems to line up exactly on the nuclear power station, probably giving credence to some crackpot conspiracy theory that God was an astronaut, or something. Looking at the golfball dome again, I was sure I could see it glowing faintly. Maybe the old bloke with the dog had been right to worry. However, ten years on we worry more about the Da Vinci Code than we do about extra-terrestrial life, and so it was with a sense of ease that I turned my bike, at last, in the direction of Saxmundham railway station.